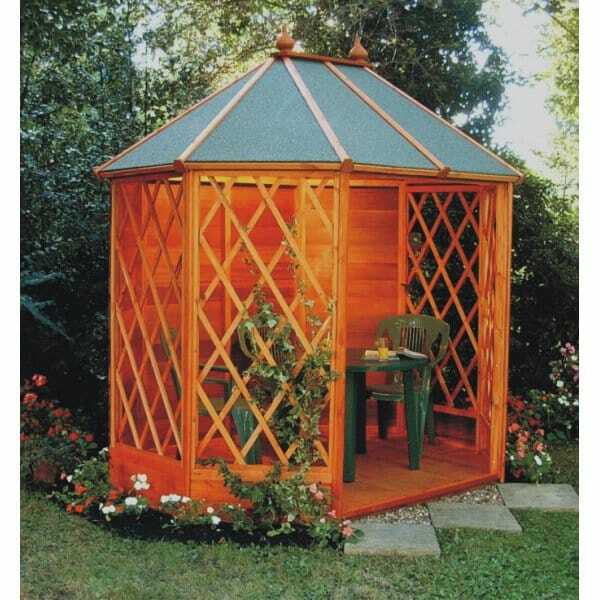 A1 Brampton Gazebo: 6 x 6 / 6 x 8 / 8 x 8: The A1 Brampton Gazebo is a lovely garden gazebo with full trellis sides and an open front which invites you to relax in style this summer season. The octagonal shape allows you to place garden furniture without feeling cramped, the top quality materials of this gazebo ensures you’ll have a wonderful place to relax for many years to come. This garden structure is easy to assemble with the T&G clad panels. The gazebo includes roof felt as standard but if you wished to upgrade to a maintenance free roof, then the slate effect fibre glass roof is an excellent option. A wonderful way to socialise or simply relax, this gazebo will be lovely addition to your garden.